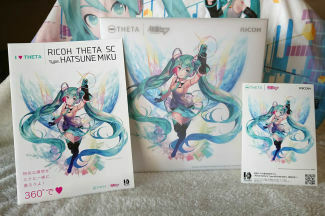 I can’t really say it enough: I love Miku, and I also love technology. 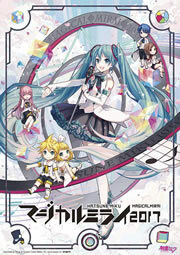 It’s probably the nature of Miku, being a vocal-synthesis software, that draws tech savvy people to to her. 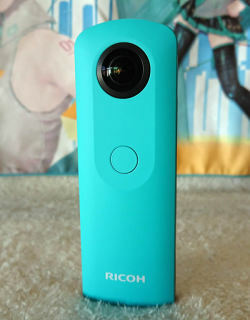 As such, I was drawn to the camera collaboration announced by RICOH, which brought Hatsune Miku to the world of 360 imaging. 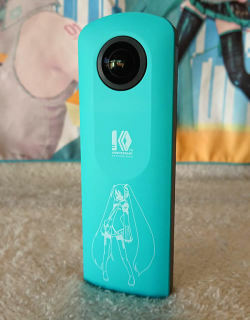 The result of this collaboration is the RICOH THETA SC Type Hatsune Miku 360 camera. 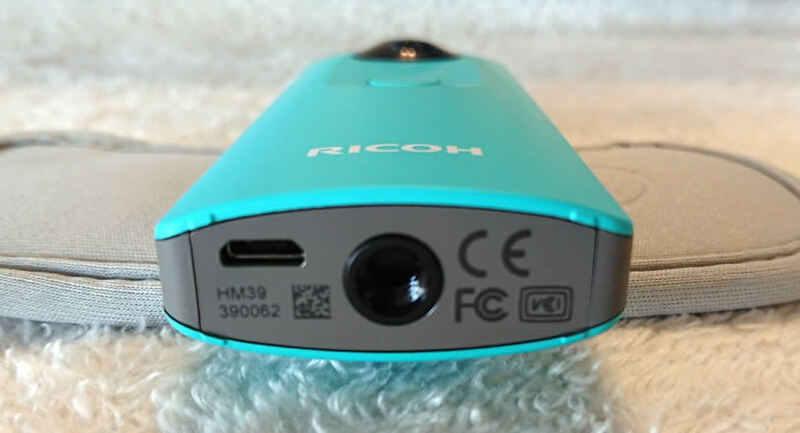 What is the RICOH THETA SC? 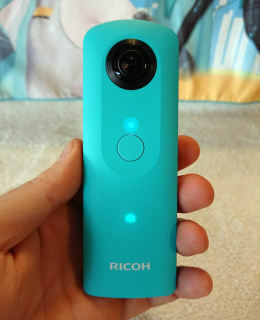 The RICOH THETA SC is RICOH’s “Standard Class” 360 degree camera, which brings 360 imaging and video to the masses at a reasonable price. It’s capable of capturing up to 1600 spherical images at max quality, or 63 minutes of 360 video at max quality. 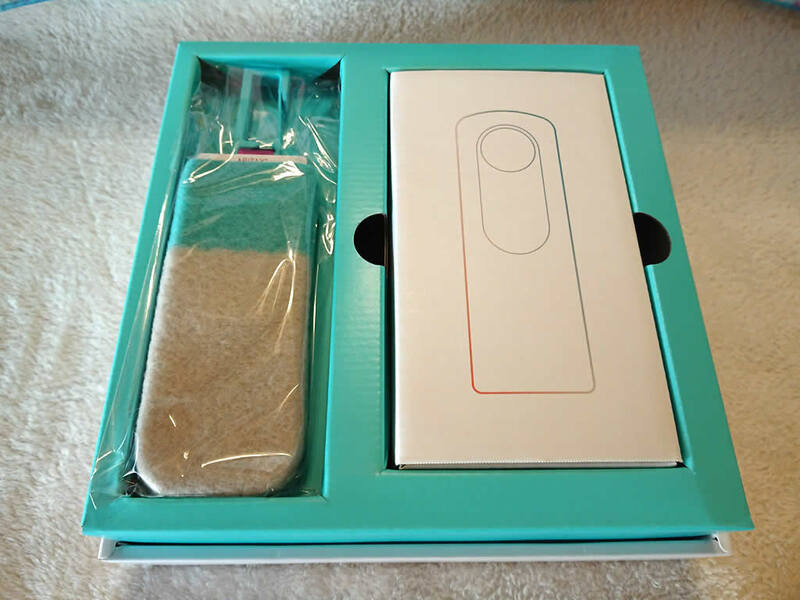 The only feature it lacks compared to the THETA S is the ability to live stream 360 video. What is the RICOH THETA SC Type Hatsune Miku? 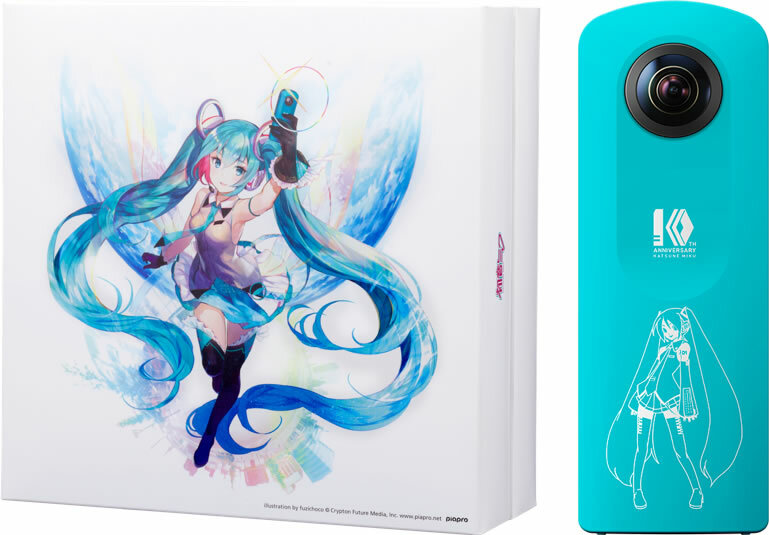 In celebration of Hatsune Miku’s 10th anniversary, RICOH introduced a limited special edition of the THETA SC, which comes bundled with exclusive accessories and editing software. 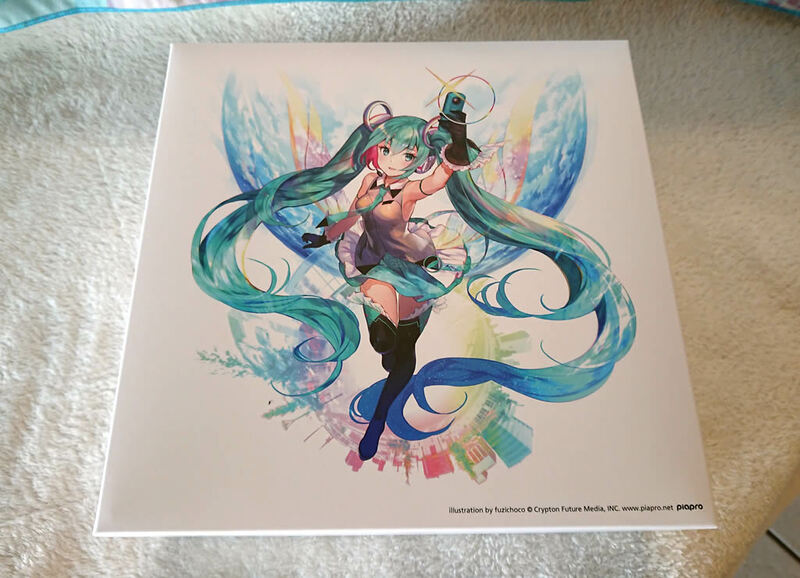 It also comes in packaging featuring special artwork illustrated by fuzichoco. 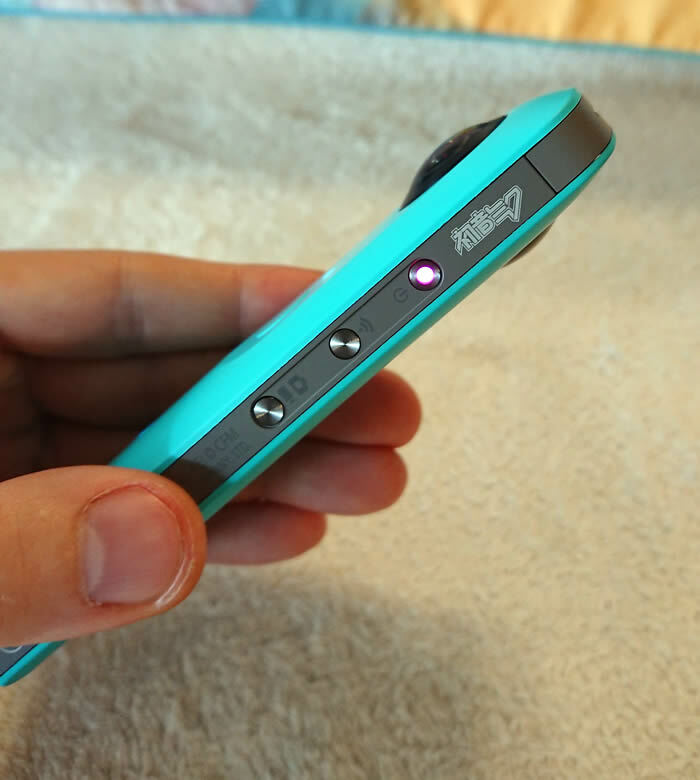 With the introduction out of the way… Let’s get to opening the camera! 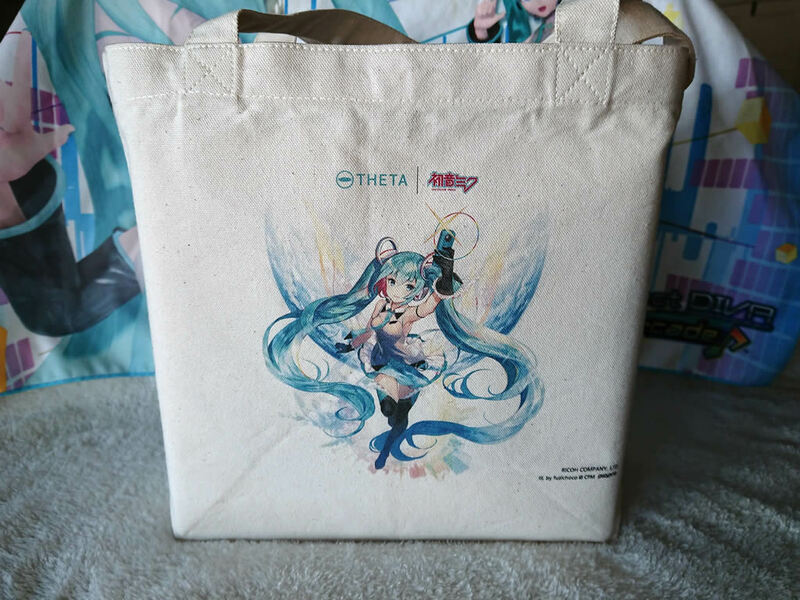 If you were lucky enough to pick up one of the limited number of cameras available at Magical Mirai 2017 (like this one! 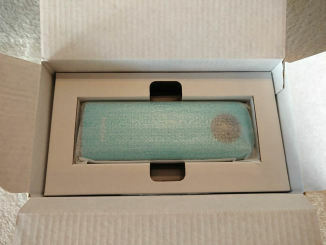 ), or from the Black Friday sale last year, your camera came with a special canvas carring bag. But I think we’re all more interested with what’s inside! Inside the bag you’ll find a sticker, a quick introduction book, and the box holding the camera itself. The artwork by fuzichoco is absolutely gorgeous! The first thing you see is the bonus wool-woven camera sleeve, and the box housing the camera itself. After removing the sleeve from the box, and removing what’s inside, you’ll find an additional clip, along with dog tags with your unique product serial number. I was able to get unit #0062! 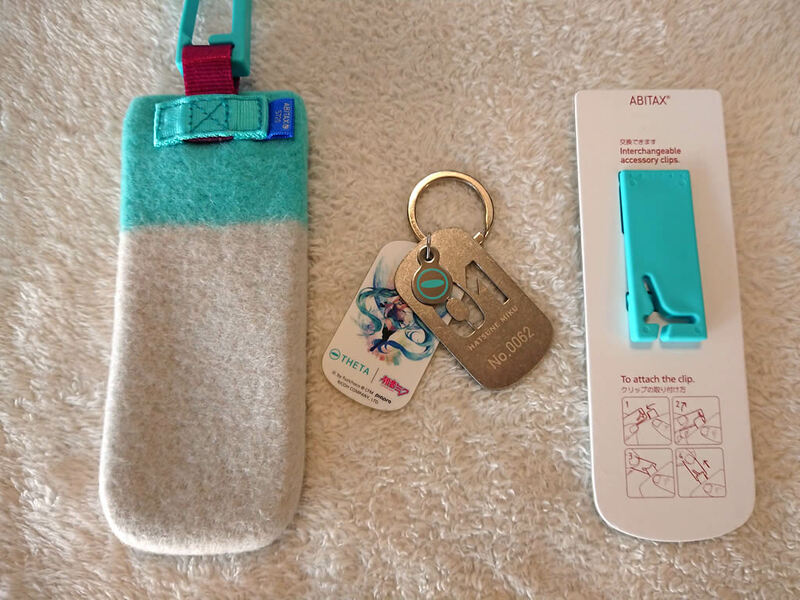 Along with the camera, you’ll find the original protective sleeve, a very solid feeling charging cable (it’s recommended to use only this cable for charging), and the user guide. The camera feels lighter than initially expected, and has a turquoise colored “soft touch” plastic shell that feels very smooth, but may be prone to staining if you’re not careful. 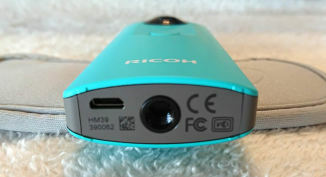 The unique serial number is printed on the bottom of the camera, next to the standard 1/4-20 camera mount. There’s 3 control buttons on the side: Power, Wifi, and Mode. 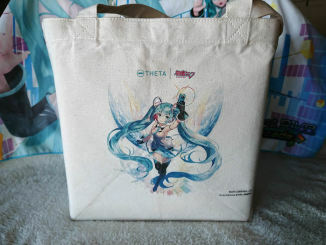 The front face has the single shutter button, and also adorns an outline artwork of the original Hatsune Miku illustration by KEI, and the Hatsune Miku 10th anniversary logo. 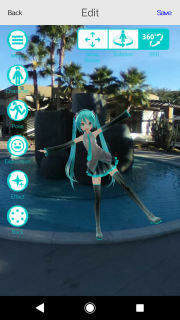 Find Miku in our sample 360 photo! Using the THETA SC Type Hatsune Miku requires the use of two applications. 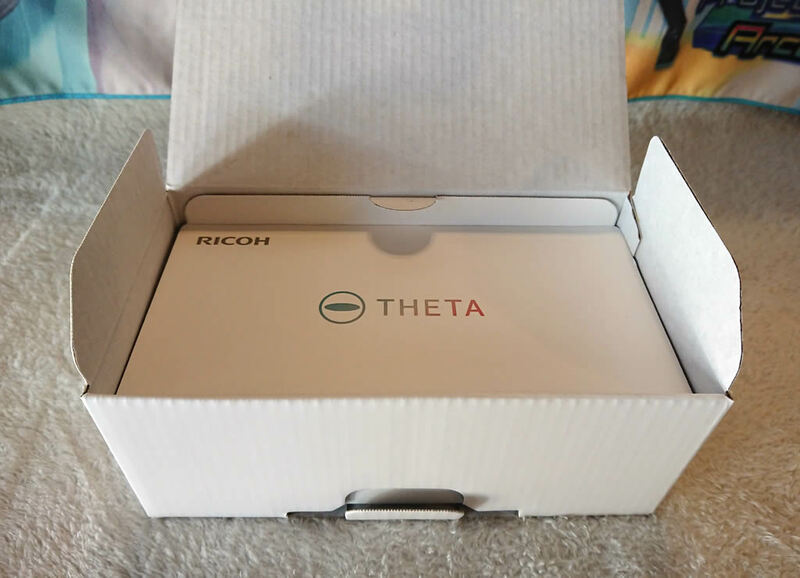 The first is the THETA SC basic app, which allows you to transfer and share photos from your camera, as well as control the camera remotely from your mobile device. 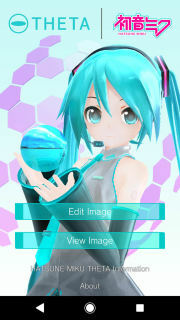 The second is the THETA SC Type Hatsune Miku exclusive app, the Hatsune Miku themed image editor (found here). This app is designed to work only with images captured from the THETA SC Type Hatsune Miku camera! 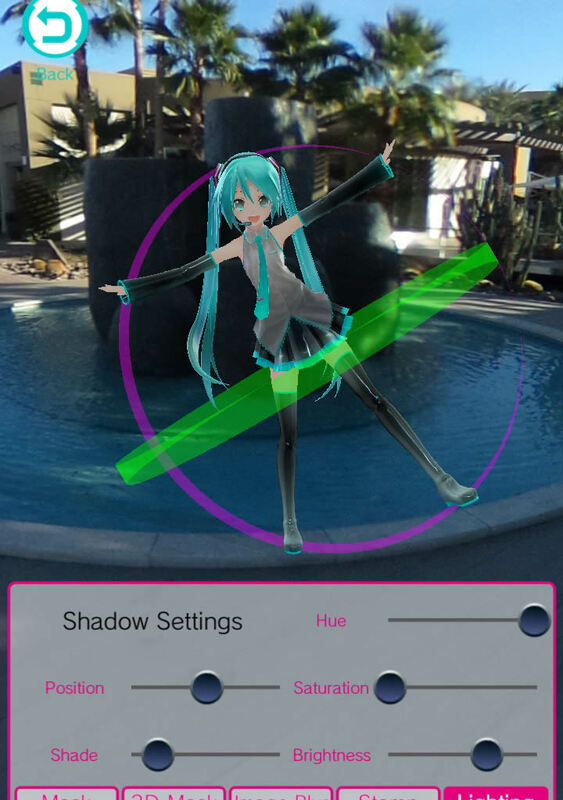 It should be no surprise that this application came from a collaboration with Sorasu Software, the same developer behind the popular Mikuture AR photo application. It comes with a familiar interface, with many improvements to details such as pose navigation and masking controls. This allows many entertaining pose possibilities! 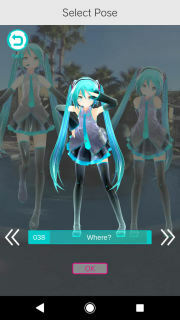 The sticker feature is also useful for “censoring” people with various (and humorous) Hachune Miku style faces. Two different Hatsune Miku models are available to choose from: The basic Appearance Miku (ApiMiku) model from Mamama, and a Snow Miku variant of the ApiMiku model. Once you are finished editing the photo, you are given the option to share your photos online! Don’t forget to add the “#miku360” hashtag to your content, so others can also find and share! The RICOH THETA SC Type Hatsune Miku is a great introduction to the world of 360 imaging for Hatsune Miku fans, if they have not experienced owning a 360 camera. Getting this camera might be a hard choice, however, for those that already own the normal THETA SC, or even the THETA S with its inclusion of live streaming functionality. 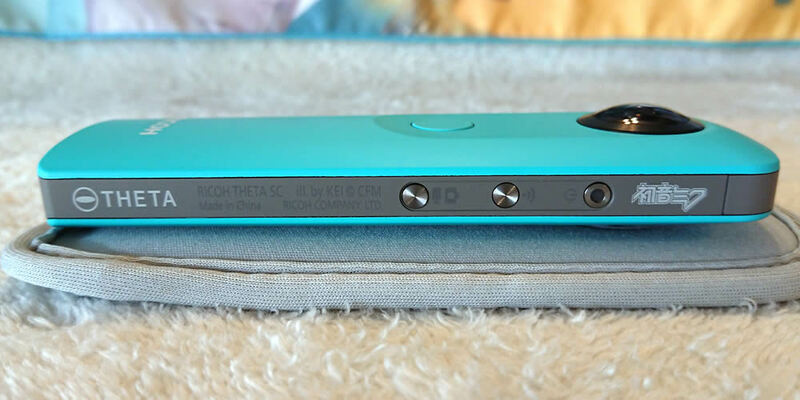 If that missing feature isn’t a deal breaker for you, then we’re certain that you’ll find the use of this camera quite entertaining! Our own personal gripes with the camera would have to be its poor image quality with objects that are far away, even with good light. Try to keep subjects of importance within 15 feet if you want them to be clear. It also does not like to be charged with most traditional USB chargers. It’s recommended to charge via a PC USB port, or with a charger rated at 1.5A or less power output. 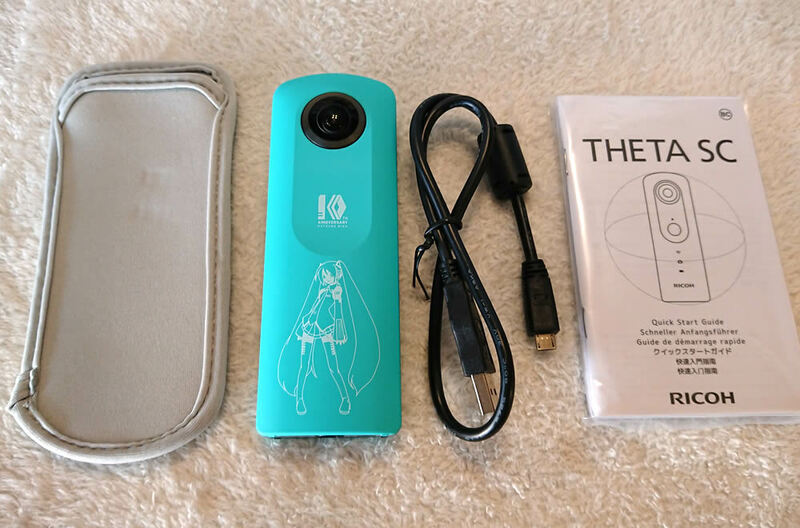 Lastly, we’re excited to announce we’ll be using this camera during our visit to Snow Miku 2018 in Sapporo, where we plan to share many of our experiences in 360! Stay tuned!